Almost everyone knows by now that many of the refillable water bottles we love are lined with an epoxy-based material that contains carcinogenic chemical called Bisphenol A (BPA). Public outcry has resulted in several manufacturers now offering bottles with alternative, non-epoxy-based linings. What is not quite so well known, however, is that the linings of most food and beverage cans are also this same type of epoxy resin that also contain BPA. This is the chemical that is responsible for the vastly longer shelf lives of canned foods in this day and age, which is why it’s become so ubiquitous. Consumer Reports recently tested a variety of canned foods for its presence, and found that even organic foods, and those made by manufacturers who make a concerted effort to avoid the epoxy resins still have significant levels of BPA in the food samples tested. Only one manufacturer, Eden, has so far managed to find a source of cans that was even willing to address the problem and attempt to make cans without BPA. 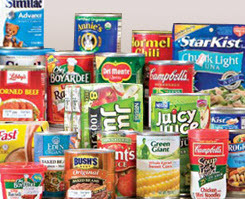 Despite being packed in cans made by the Ball Corp. with the oleo-based material previously known as “corn enamel”, which was common in food can linings prior to the 60s, testing still found measurable levels of BPA in Eden’s foods (although vastly below those found in other brands), suggesting that there may be multiple sources of exposure to the chemical in the food chain, not just in the cans. You can read the rest of the whole article about this, and learn about the FDA’s new assessments of what a safe level of BPA exposure may be on the Consumer Reports blog. So should you clean out your kitchen cabinets, throw away all of your canned foods, and never buy any more? In the ideal world, perhaps yes, but we all know that we don’t live in one. BPA is one of the highest volume chemicals in the world, though, even found in dust and water samples from all over the world, so at this point, it’s completely unavoidable in the environment, and it would be a reasonable assumption that this is one of the additional sources Consumer Reports speculates about. Eliminating BPA from food can linings may help, but until that happens, you can at least dramatically decrease your exposure to it by avoiding canned food wherever possible. So what does this have to do with interior design? Well, clearly kitchens are where food is stored and prepared, and most are now designed with as much storage space as possible for both housewares and packaged foods. You may find, however, that as you reduce your reliance on canned goods and other processed foods, that you may need different types of storage, and it may need to be configured somewhat differently. Many things can be packaged in glass or ceramic containers instead of plastic or cans, but both glass and ceramics tend to be a lot heavier and bulkier than cans and plastic containers, and of course will break if dropped, so you’ll need to pay careful attention to how your storage is laid out so that they are easily – and safely – accessible. Increased refrigeration space may be required as well, in order to accomm0date a wider range of fresh produce and other foods. It may be that you won’t actually even need as much space, though, because the shorter shelf lives of fresh foods and those that come in jars instead of cans means you’ll probably be shopping more often, but for smaller quantities. Or perhaps you’ll start buying in bulk and doing your own canning and preserving. You’ll be chopping up more things, so ensuring adequate preparation space that suits your needs and ideally allows you to work while seated as well as standing will be useful. You may need or want additional cooktop burners or additional and innovative cooking sources like the marvelous new steam or combination steam/convection ovens. Steaming is one of the best possible ways to prepare food, locking in both nutrients and moisture, and these ovens make it so incredibly convenient that you wouldn’t believe it. And because it’s healthier for both you and the environment, avoiding canned foods and learning to make your own fresh, more healthful meals from scratch, you’ll also be being much more green. True sustainable design doesn’t end with the cabinets and other finishes used; it translates through to how the space is used, how waste is removed, and much, much more. So, if you’re designing a new kitchen, you’ll need to take these changing food preparation habits into account, and communicate your desires to your designer, so that the space can be optimized for food preparation patterns that are less common today than they used to be, and with which you yourself may not yet be as familiar with the requirements of and ways to optimize.